From a young age, children are often asked what they want to be when they grow up. Answers typically include something along the lines of firefighter, teacher or doctor. Less common are answers like chemist, physicist, web developer or mechanical engineer. Yet, with the push to prioritize science, technology, engineering and math education earlier in schools, children are introduced to new fields and career paths, opening up the opportunities for their futures. STEM programs teach students not only about science and math, but also about the future of our society and economy. Such programs enable students to acquire more of the knowledge necessary to achieve success in today’s increasingly competitive job market and lead society in the future. The Department of Commerce’s Economics and Statistics Administration projects STEM occupations will grow 8.9 percent between 2014 and 2024, compared to 6.4 percent projected growth for non-STEM occupations. Kindergarteners through seniors in high school will lead the charge in that growth, entering the workforce with a cross-disciplinary education and comprehensive skill set. Mines has played a large part in encouraging this outreach to K-12 students and inspiring younger generations to pursue interests in STEM. From events geared toward supporting girls and young women to enter STEM fields to teaching a classroom of elementary students how math can be fun, Mines helps K-12 students achieve their highest potential and be whatever they want to be when they grow up. When Smits received a National Science Foundation CAREER Award three years ago, it felt natural to dedicate the educational outreach portion of her grant to reaching potential future scientists and engineers on their own turf—a middle school classroom. Twice a week, 12-15 Mines students visit College View Middle School, a public charter school in south Denver, for math and science tutoring and mentoring. Recently, that meant helping the middle schoolers go over their last test, on linear equations. College View, part of the Denver School of Science and Technology network, is 85 percent minority and 90 percent low income. Students attend tutoring based on need, teacher requirement or interest. In addition to tutoring, Mines students are encouraged to talk to the middle schoolers about careers, college and life. Some of the tutors are interested in pursuing a teaching career, while others like working with young people or just want a break from their own schoolwork. Three years into a five-year grant, the tutoring program is already seeing results, too, Smits said. Students who have never tested at grade level on standardized math and science tests are passing for the first time, and their own survey data shows increasing confidence and interest in math and science. When John Osborne ’66 retired from the microchip industry after 35 years and moved to Twin Bridges, Montana, he and his wife decided to offer scholarships to local students interested in pursuing engineering or science in college. One of the scholarship winners, a young woman who had been valedictorian in high school and was interested in pursuing a career in biomedicine, was accepted into a prestigious university on the East Coast. However, despite her high SAT scores and a 4.0 grade-point average in high school, the young woman found herself falling behind in math, chemistry and physics and dropped out of the biomedical program in favor of a different discipline. “I thought, if someone with that amount of intelligence and drive struggled with their collegiate career, then giving them a scholarship wasn’t as much help as looking at the infrastructure of the K-12 system itself,” Osborne said. He read about a nonprofit organization called Project Lead the Way (PLTW) that empowers students to develop and apply in-demand, transportable skills by exploring real-world challenges and learning how to problem-solve and think critically. Inspired by the organization’s model to help prepare students for collegiate life and their professional careers, Osborne thought a STEM program might be a good fit at Twin Bridges School, a local K-12 school with a total of 225 students. The Twin Bridges school system is thought to be the smallest K-12 district in the U.S. known to have implemented the PTLW program at the elementary, middle and high school levels. After approval from the school board, the program was implemented in sixth-, seventh- and eighth-grade classrooms. Students got hands-on experience with projects such as designing, building and testing orthopedic boots. The program also features a medical detective initiative and even a robotics section, which has enabled some students to participate in statewide robotics competitions. Osborne was able to procure additional startup resources, including funding and program mentoring from Brewer Science, a microchip material company in Rolla, Missouri. Brewer Science has since offered a summer shadow/internship program to expose students to the working environment of an advanced technology company. At the beginning of the current school year, Osborne donated additional funds to purchase iPads for kindergarteners to use an app specifically designed to teach STEM to that age group. “The focus went from thinking that high school students would benefit the most from the program, to watching 6-year-olds learn shape recognition and associations,” he said. 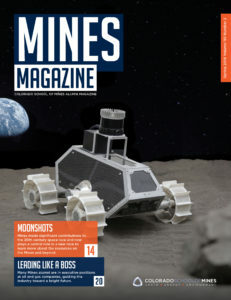 To help fill this gap, Mines has several programs in place and hosts events to support young girls in kindergarten through 12th grade in their pursuits of STEM education and careers. These events, among others, help young girls reach their full potential and become future scientists, mathematicians, engineers and leaders.